As an added bonus, we’ve purchased a new table as well. This table now occupies a corner of our bedroom. 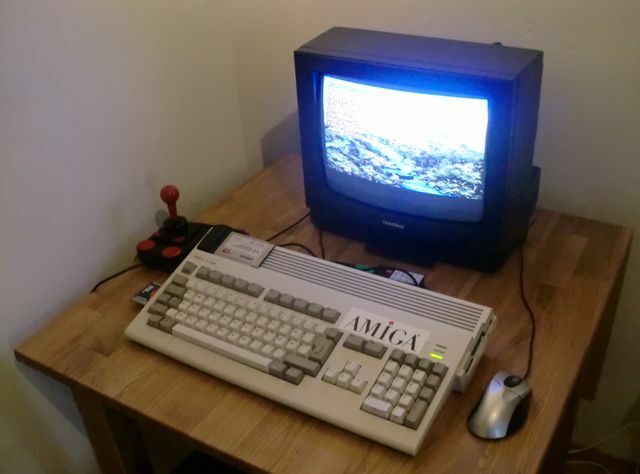 This is now the official “Amiga-zone” in our flat. 😉 It’s great to have an Amiga permanently hooked up and ready to go. No PC nearby either to steal its “thunder”. Here's my Amiga 1200 hooked up to the Goldstar TV. My Amiga 1200 setup. Optical mouse on the right, Competition Pro on the left. PCMCIA Compact Flash adapter also on the left with a 512MB card. On top of the machine is a WLAN-card from AmigaKit. At the back of the machine you can spot a Micromys mouse-adapter. The Flight of the Amazon Queen, a great adventure game. This is the WHD-Load version. 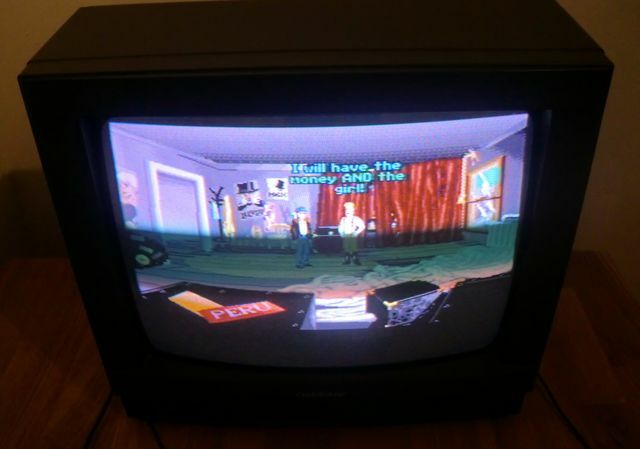 Using a CRT gives me a special retro-feeling, so I’m very happy about this TV. 🙂 The Hunt for the CRT is now officially over and it all ended well. Next Amiga: Tired of floppies? 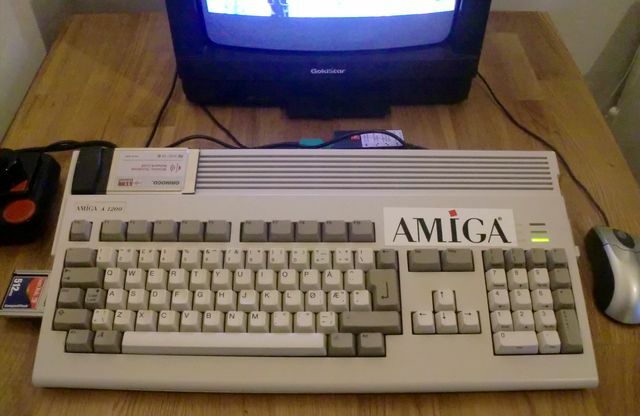 It’s great to see that you’ve still got an Amiga 1200. What kind of tower do you have? Micronik? Power Computing? Ahh, that seems like a fine demo from Genesis. I think I’ve seen it way back then, but will have to watch it again now. 😉 Have you been active on the Scene btw? It stops somewhere in init. Nice that you have the Micronik tower. Looks nice. 🙂 Are you planning to add some extensions? Thanks for posting that video-link. Will check it out! Great stuff! I wonder on what you had to compromise to get that in the bedroom? 🙂 Whatever it is it is worth it. My wife is really pressuring me to get the computer room done so the A1SE can go from her room. She really needs the space for her new ventures. Sounds good. 🙂 Looking forward to read more about it on your blog! More pictures of the tv please? I got rid of one of these back in the early 2000s and still regret it, I can’t find any pictures that look similar to it except for the tv you posted. what model is it? Hi there! Thanks for commenting, but I use another TV these days. That was a Goldstar TV. I’ll see if I have noted down the model-number somewhere. Cheers!